The Hamilton watch company has a long and extensive history. Although I love the older manual winding Hamilton’s, lately I have been obsessed with the Hamilton Electrics. 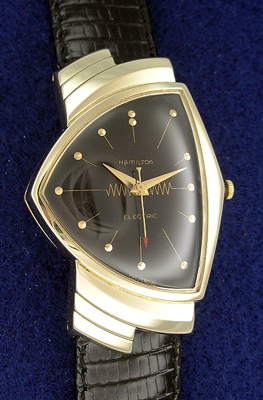 Research for the first battery operated watch began by Hamilton in 1946. It wasn’t until 1957 that Hamilton announced the release of the “Ventura” the world’s first battery powered watch. 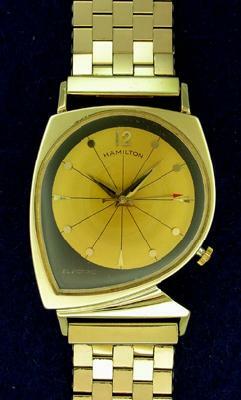 For the next 12 years, Hamilton would produce some of the most interesting and highly sought after “Space Age” designs. Check out the Meteor, Altair, Flight, Ventura, & Regulus below. If you watch some of the original Twilight Zone episodes, you might notice Rod Serling wearing the Ventura. Rene Rondeau is considered the leading expert on the Hamilton Electric and also has various models available for purchase from time to time. “Meteor” model – The asymetrical shape of this watch is incredible! “Regulus” model – Extremely rare electric. “Altair” model – This is one of my favorites!